This column is from last month, June 19th 2017. In it, I looked at Taoiseach Varadkar’s first few faltering days in office and conclude that things have not been going according to his masterplan. Even the more ardent blueshirt cannot call a cabinet that contains FG ministers who entered the Oireachtas in 1981 (Bruton), 1987 (Flanagan) and 1989 (Creed), 1992 (Fitzgerald) and 1994 (Ring) new or fresh. “Silage and Ice-cream”. This is how Audrey Carville defined the classic Irish Summer on RTÉ Radio One’s Morning Ireland earlier today. And though silage was not exactly plentiful in the Liberties, Rathmines or even Yellowbatter in Drogheda during my childhood years, I think I know what she means. Indeed, up to this morning I hadn’t realised that silage is spelled with just one “l”. Though I cannot recall using the word in many speeches, reports or articles I am virtually certain that I used two “l”s anytime I have written it. I know for sure that I used two “l”s when I went searching for the phrase just before writing this piece, only to discover that the two “l”-ed version of silage, i.e. sillage (pronounced as if there were no “l”s at all in the word) is the word used to describe the lingering fragrance that someone’s perfume leaves in the air. Silage and ice-cream may also be an apt phrase to describe Leo Varadkar’s first few days as Taoiseach. The ice-cream has come in the form of the positive coverage his elevation to high office has generated, both at home and abroad, though that may be starting to melt a bit after two solid weeks of learning what a wonderfully precocious child he was and how he wrote his first letter to the Irish Times aged three, or whatever. His first TV interview with Tommy Gorman was good. He was clear, concise and on top of his brief. The fact that he opted to do his first one-to-one TV encounter as Taoiseach with RTÉ’s northern editor was clearly intended to signal that the North would be a priority with this Taoiseach in a way that it had not been for his predecessor. It was also interesting that he opted to set out his government’s policy approach to the North and re-unification himself having just appointed his rival, Simon Coveney, as the line minister dealing with the brief, a signal perhaps of things to come. But, and not for the first time, a gap emerged between what he says and what he does. His decision to just meet with the leaders of two of the North’s five major political parties was not a good first move. In using his first actions on the North to meet with just Arlene Foster of the DUP and Sinn Féin’s Michelle O’Neill, and not to meet with the leaders of the other three centre ground parties: the SDLP, UUP and Alliance, the new Taoiseach was perpetuating the mistake made by recent Irish governments. Yes, a deal on the return of Stormont and the Executive is not possible without the two big beasts of the DUP and Sinn Féin agreeing to again work together, but the smaller parties should not be taken for granted. Even the British government realised that when it invited all the parties to Downing Street last Thursday, not just the big two. Taoiseach Varadkar made a silly unforced error in appearing to relegate the smaller parties to the second division of negotiation. Their participation in the institutions is as important and crucial as that of the DUP and SF. If anything, the events of the second half of last year suggest that it is even more important, as the two main parties seem unable to reach accommodations in office without the smaller parties there to give them cover. Varadkar should know this. He sits at a Cabinet which could not continue in office if it were not for the involvement of smaller parties and Independents though, as we see from today’s latest development in the Marie Whelan appointment saga, he may know it, but he doesn’t show it. Perhaps this is the point. Perhaps his near disdainful attitude to the smaller parties in the North just echoes his disdainful attitude to its own partners in government? The incredible, some would say grubby, rush to get Marie Whelan quickly sworn in as a judge of the appeal court this morning so that the sorry saga is all over and down before tomorrow’s Cabinet meeting is a brazen throw down to Ministers Ross and Naughten and – by extension to Fianna Fáil. Is this just Varadkar bravado, showing early on that he is now the boss and what he says goes? Or, is the nomination a difficult, but essential, element of the succession’s realpolitik that he must see through to the end, no matter how the stench adheres to him? I suspect this is more the latter. Those who say that Leo has wiped Fianna Fáil’s eye by pushing this through seem to miss the point that this appointment, coupled with the fiasco of the cabinet reshuffle that wasn’t, has just shortened what could have been an extensive Varadkar honeymoon. As every job interviewee had been told: you only get one chance to make a first impression and Leo has wasted his. Meanwhile, Fianna Fáil will wait for its moment to exact some political revenge and that will be a moment of its choosing, not Leo’s. If Fianna Fáil is to bring down this government let be on an issue of policy that affects people’s lives, not “beltway” process. The Marie Whelan saga was not of Varadkar’s making, but his ownership of a move that looks suspiciously like a vintage political stroke, is now 100%. The appointment was brought to Cabinet as the last act of the outgoing Taoiseach and outgoing Justice Minister, but by defending it so fiercely the new Taoiseach has made it his own… alone… and, unless I am missing something, I have not seen the new, sorry… the incoming… Minister for Justice, Charlie Flanagan, (it hardly seems right calling someone who has been in the Dáil since 1987 “new”) rushing to the barricades to help. If Varadkar has been preparing all his political life for this moment, then it is hard to believe that this is what he had planned. You cannot call a cabinet that contains FG ministers who entered the Oireachtas in 1981 (Bruton), 1987 (Flanagan) and 1989 (Creed), 1992 (Fitzgerald) and 1994 (Ring) new or fresh. We shall see tomorrow how he handles the even trickier issue of appointing Junior Ministers. Will he be bold and courageous in these hardly earth-shattering selections, or will he just do what he did with the cabinet? Are these first faltering steps a case of the promises made to secure election restricting the ability to operate, or is the problem more fundamental? Can Varadkar be the thrusting and dynamic Taoiseach his Fine Gael parliamentary colleagues longed for, or will he just become the commentator-in-chief? Is that the sillage of silage or of raspberry ripple ice-cream. Excuse me, I must be off to Teddys in Sandycove! With these words, Richard Nixon departed the political scene, well almost. It was November 7th, 1962. He was concluding what he assumed would be his last ever political press conference after losing the race to become Governor of California. Two years earlier he had narrowly lost the Presidency to John F Kennedy. While Enda Kenny’s departure, when it comes – possibly over the next week or two – will not be as bitter and waspish as Tricky Dicky’s, there may just be the slightest hint of the same sentiment: just think what we will potentially be missing. 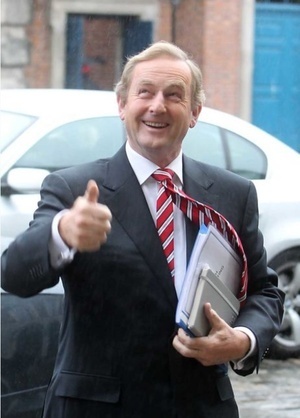 Love him or loathe him, during his time as Taoiseach Enda has been anything but colourless or bland. For all his faults and failings, he showed quickly that he realised that one of the main roles of any Taoiseach is re-assuring the public that there is someone with a plan in charge. He also grasped that this role as the nation’s re-assurer-in-chief requires you to get out and about and meet people as much as possible. In some ways, Enda has spent the past six years doing a passable Bertie Ahern impression. No one does heaves like Fine Gael does heaves. None of your subtle behind the scenes manoeuvrings for them. When it comes to getting political blood on the plush axminster the good folks at Fine Gael are major exhibitionists. They have had plenty of heaves over the past forty years or so: most of them ill-judged, poorly timed and glaringly unsuccessful. The December 1972 heave against Liam Cosgrave is a good example of all three. Fine Gael’s liberal wing wanted rid of the conservative, law and order Cosgrave. They complained that the party had failed under his leadership to capitalise on Fianna Fáil’s post Arms Crisis trials and tribulations, but the final straw was Cosgrave’s efforts to get FG TDs to back the government’s controversial Offences Against the State Bill – something they implacably opposed. Cosgrave was effectively saved from the plotters by a loyalist bomb on Sackville Place that tragically killed two CIE busmen. The explosion took place just hours before the Dáil vote on the Bill. The Dáil adjourned to allow discussion between the parties. When it resumed, Fine Gael withdrew its opposition and abstained as Bill was voted through in an all-night sitting. Three months later Cosgrave became Taoiseach leading Fine Gael into government with the Labour Party. Fast forward to 1980s and 1990s and we enter the golden age of the Fine Gael heave. The drama and intrigue within the Fine Gael parliamentary party was so intense that RTÉ ran a TV documentary series in 2003 about the period entitled: Fine Gael: A Family at War. For about two decades the folks in blue were regularly sharpening their knives as they awaited the opportunity to dispatch their leaders. While Dr Garret Fitzgerald managed to escape their clutches his successor, Alan Dukes, had a less happy fate. Dukes took over from Fitzgerald after the 1987 defeat. While he started out well, Duke’s Tallaght Strategy – a less formalised precursor of the current Confidence and Supply Agreement, which facilitated Haughey’s minority government – was not too popular with FG TDs. One TD, Austin Deasy, was so incensed that he at first resigned in protest from the party only to return in 1989 and try, unsuccessfully, to oust Dukes. Deasy was a serial heaver, launching his first one first against Garret in 1982 and finishing up with his failed November 2000 one against John Bruton. Dukes survived, but not for long. In a snap election in June 1989, Fine Gael regained only 5 of the 19 seats they lost two years earlier. The whispering campaign against Dukes was back with a vengeance with one back bencher remarking that if it was raining soup Dukes would be out there with a fork. Things came to a head in late 1990 when the party’s candidate in the presidential election came a very poor third behind Mary Robinson and Brian Lenihan Snr. The result had hardly been declared when Fergus O’Brien, who had been demoted by Dukes, tabled a motion of no confidence. This was followed by a flurry of Fine Gael TDs rushing to the nearest journalist to unburden themselves. Dukes could not withstand the onslaught. Within days he resigned and was succeeded by John Bruton. Now the Fine Gael heavers shifted into top gear. It seemed as if there was a heave brewing every few months. Bruton survived five leadership contests during his eleven years at the top. The sixth one, in January 2001, led by two political heavy weights Jim Mitchell and Michael Noonan succeeded in toppling him. Noonan took the top job, beating Enda Kenny, but his reign was short lived. 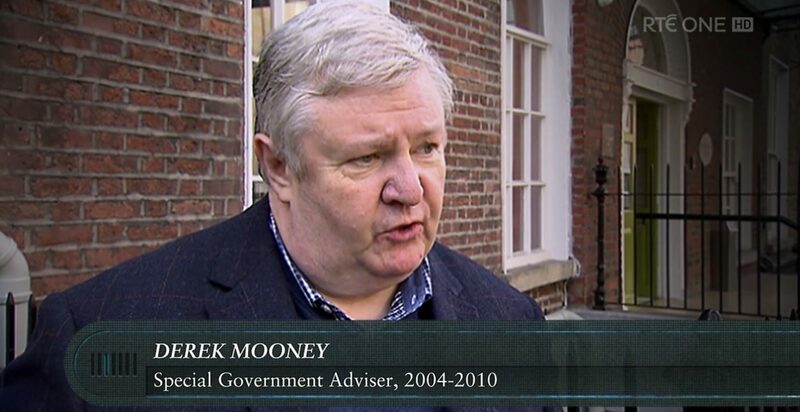 FG’s defeat in the May 2002 election was so calamitous that Noonan resigned on the night of the count. He was succeeded by Enda Kenny. As you can see from these examples and the June 2010 heave against Enda outlined in my Enda’s 3am question is still unanswered Broadsheet column: most of them fail. The ones that do succeed have the oblique backing of the person who hopes to succeed and are usually attempted when the party is in opposition – not in government. This later point is perhaps not so relevant today. Fine Gael spent most of the 80s and 90s in opposition and were not in office long enough to have the time to consider it. It was these long periods of opposition – and powerlessness – that led to the heaves. The breaking point, in most cases, being a bad election result or a series of poor opinion poll results. This heave is different or at least it appears different. Unlike heaves of the past it has been occasioned by an actual political event, namely the chronic mishandling of the Sgt McCabe debacle and the confusion about who told who said what and when and if they told the Taoiseach or just one of his Advisers. But it would be foolish to think that electoral considerations are not also a major factor. While Enda Kenny has made it clear that he does not intend to lead his party into the next election, the abiding fear among Fine Gael TDs was that events would overtake them and that Fianna Fáil would pull down the house of cards before Enda quits and they find themselves facing an election with Enda still in place. Up to a few weeks ago, they assumed that Fianna Fáil was neither ready nor willing to trigger an election until 2018 – but a series of good polls for Micheál Martin’s soldiers of destiny has convinced already rattled Fine Gael TDs that Fianna Fáil was preparing itself to call time on the government. The problem with this scenario is that it shows Fine Gaelers thinking like Fine Gaelers, not like Fianna Fáilers. Fianna Fáil knows well that voters tend not to reward parties who trigger unnecessary elections for partisan gain. Martin’s FF eschews the “cute hoor” tag that once bedevilled the party. When it eventually moves against the government it will be seen clearly do so on an issue of policy, not personality or partisan gain. On a more practical front, 20 of Fianna Fáil’s 45 TDs are first timers. They are just starting to settle in after two or three years of intense campaigning to win those seats. They are not ready or prepared for an election yet. Most are now watching the turmoil in the FG ranks and trying to work out whether the election of Simon or Leo – or neither – means the election will be in May, June, September or later. Meanwhile the rest should reach for the popcorn, scan our WhatApp to see if Charlie Flanagan is messaging us and just enjoy it all. This is how the late Maurice Peston (father of ITV’s political editor Robert Peston) responded in the early 1970s when a senior UK civil servant asked him to explain how he saw his role as Roy Hattersley’s newly appointed Special Adviser (Spad). It was more than just a casual witty remark from the Professor of Economics: it specifically referenced the fears the Department of Prices and Consumer Protection had about having an acknowledged policy expert in their midst and gainsaying their more generalist advice. This is my Broadsheet “Mooney on Monday” from Monday piece from June 27th on how the Irish Government (and politicians) must act in response to the UK’s Brexit vote. There is a new (though not uncritical) pro-EU majority across the island that should be encouraged and fostered via a re-establishment of the Forum on Europe. There must not any a return of form of border across the island. For as long as I can recall it has been a central tenet of Unionism that the status of Northern Ireland should not change without the political consent of the majority of the people living there. Despite the fact that a clear majority – some 56% – of the people of Northern Ireland who voted, including large numbers from both traditions, stated that they wanted to remain in the EU, their wishes are about to be ignored. It seems that a majority in the North is only a majority when the DUP is a part of it. This blog first appeared on the Slugger O’Toole website earlier today. Whether polling day is on Feb 26th or March 4th, it is clear that we are only two or three weeks away from the start of the great 2016 corriboard shortage… sorry, the 2016 general election. Over the coming two weekends we will have the Fianna Fáil and then the Fine Gael Ard Fheiseanna, followed by Labour at the end of January – presuming that Enda hasn’t already called the election and pulled the plug on Labour’s big day out. While the corriboard campaign posters remain in their wrappings and the Vote for me leaflets stand ready, the electioneering has already as good as started. 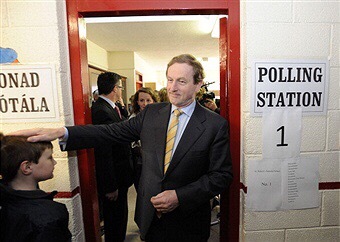 Could it be that Fine Gael’s own private polling is telling them something the national newspapers polls are missing? It occurred to me recently that Enda has spent the last few years doing a very bad Bertie Ahern impression – making Enda the Bobby Davro of Irish politics you might say. Enda gets the minor gestures and mannerisms right – but he misses the core of the character. Enda may be as accomplished and expert a glad handler as Bertie when it comes to wading into a crowd and shaking the hand and slapping the of everyone around him, but he his mimicry is one dimensional. He does not possess Bertie’s skill and ability to command the facts and figures when engaging with the media on door step interviews. While Enda still possesses many skills and abilities, not least his steely determination and ruthless streak, he is not politically hard wired to endure or sustain a long election campaign – especially if he hopes to keep his media interactions down to a few tightly managed ones. In this context Fine Gael’s attempts to transpose the most recent Tory election campaign strategy to Ireland seriously risking backfiring on them and only highlighting the weaknesses they hoped to obscure. It is a mistake on two fronts. First as they seem to be copying the Tory playbook here with minimal changes and basic adaptions. While the Tories undoubtedly mounted a superb social media campaign in the 2015 UK general election and used the platforms, particularly Facebook, more effectively than most of their rivals (apart from the SNP who are the master campaigners both online and on the ground) that does not mean you take their campaign slogans and approaches lock stock and barrel. What works in a FPTP system does not necessarily work in a PR-STV one. Depending on where you live in a FPTP system you can find yourself voting for someone you don’t like rather than the one you do like most just so you can make sure the one you dislike more is kept out. The idea that a vote for Fianna Fáil or Independent alliance is a vote for Sinn Féin is not so easy to sell in an STV system where the voter can vote the entire panel right down the line and omit the local SF candidate. That said is easy to see the attractiveness of the Tory playbook for Fine Gael. The Tories succeeded in keeping their leader out of head to head debates, Fine Gael want and need to do the same – though for different reasons. While Cameron was wary of elevating Milliband by sharing a head to head debate platform with him – there were no questions about the PM’s capacity to perform well in a head to head debate. The other attraction was the Tories successful cannibalisation of their Lib Dems coalition partners. Cameron’s gains came mostly from Lib Dem losses (The Tories took 27 of the 49 Lib Dem seats lost as opposed to 12 lost to Labour and 10 to the SNP) – an option that Fine Gael is eyeing up here, using Labour losses to shore up their own numbers. Fine Gael are ready to fight this campaign to the last Labour TD. Though Fine Gael’s polling numbers have recovered recently – at precisely the time they needed them to recover – they are still on course to lose seats, even if they do get 31/32% in the polls. While these improving numbers are no mere coincidence and are a tribute to Fine Gael’s political strategists, the idea that seems to be floating about the commentariat that Fine Gael is now some invincible campaigning machine is more than a little bit short of the mark. Fine Gael is having a few problems of its own right now, and they are problems entirely of its own making. Though they will doubtless address the issue between now and the Árd Fheis (and possibly drum up future local difficulties in the process) Fine Gael was still short of the 30% gender quota up to a few days ago – a system they introduced and championed. Not only that but its head-quarters operation has just ended an unseemly, costly and ultimately unsuccessful fight in the Courts with one of their own candidates: John Perry TD. And before I am accused me of dragging up these problems like a Fianna Fáil-er whistling past the graveyard, I do not think this is a zero sum game. I do not presume that any loss of ground by Fine Gael over the campaign will automatically translate into a Fianna Fáil gain. Fianna Fáil will have to make its own ground in this one and will need to land some hefty punches on Enda, Leo, Michael and Simon, it cannot depend on Enda and Fine Gael to just lose it. Enda’s #armygate saga has had pundits of all hues falling over themselves to explain, or even excuse, how and why An Taoiseach went to a recent EPP gathering in Madrid and told a story about the Irish Defences Forces being on standby to protect ATMs back in 2012. Some have seen this as just another example of the perils of letting Enda go off script. Others suggest it shows that his grip on the actualité is slipping, a bit like his story of the woman thanking him after the Budget. In order to retain my punditry badge, let me weigh in with another possible explanation. I think Enda is suffering from Ransom Stoddard Syndrome. For Enda the legend of Enda has become confused with fact. The Enda legend or, to use the political communications parlance, the Enda narrative, is that he and Fine Gael manfully pulled Ireland back from the brink. In Fine Gael’s mind they inherited a bankrupt and dysfunctional country and, with careful planning and skilful leadership, turned it around to become the fastest growing economy in Europe. Not only that, they also tell themselves (and others) that the recession would never have hit Ireland if only Fine Gael had been in office for the preceding decade. It is this narrative Enda was sharing with his colleagues in the EPP. The problem is that the facts don’t back it up, so Fine Gael and Enda must construct its own facts, facts based on its legends. As Noel Whelan points out in his column in the Irish Times: Kenny gaffe over army and ATMs part of pattern of deception this is not the first, second or third time Enda has uttered this story of Army, ATMs and the Central Bank. This story has been constructed not only to fit into a narrative of the past, it is structured so as to advance it. Yes, as others have pointed out, it does highlight Enda’s recurring issues with going off script and ad-libbing, but it is about more than a Taoiseach who can’t be trusted out on his own and who can’t remember his lines. It is about a party in government that is all narrative and no facts. 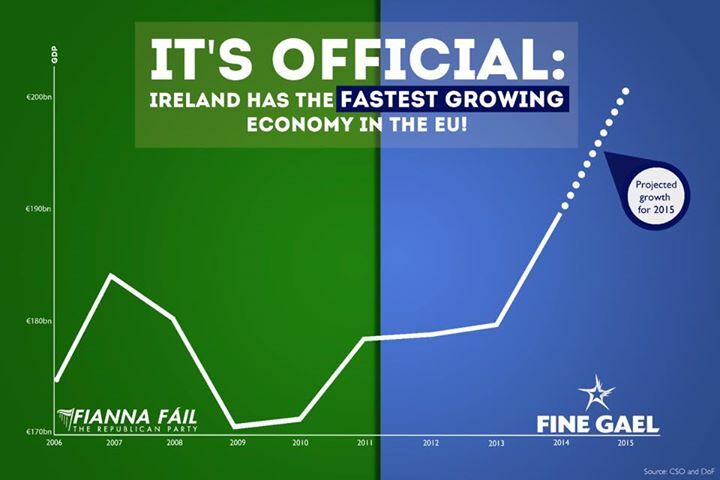 Last week the Fine Gael placed a graphic on its Facebook page which purported to show that it alone had secured Ireland’s recovery and made Ireland the fastest growing economy in the EU. To even the most casual of viewers the graphic, especially ones who ignore the dodgy Y axis increments, shows that the bulk of the recovery had been secured before the 2011 election and that the economy had effectively flat lined for the first two years of Fine Gael and Labour’s time in office. Try searching for the 2002 and 2007 Fine Gael manifestos on the party’s website – you won’t find them. Neither will you find the many statements from Fine Gael spokespeople urging more spending after every Budget. The reality that both campaign platforms, plus the party statements promised to spend more and tax less than the Fianna Fáil alternatives does not sit well with the new Fine Gael legend. Where Fine Gael is all narrative and no facts – Fianna Fáil has the opposite problem, it is all facts and precious little narrative. Up to the appearance of Brian Cowen and Bertie Ahern before the Banking Inquiry Fianna Fáil spokespeople seemed singularly unwilling to talk about the years leading up to the 2011 election. It seemed that they, like Fine Gael, thought that talking about the period 2002 – 2011 could only damage the party – but as Cowen and Ahern showed, setting the record straight and speaking candidly about what actually happened does not undermine Fianna Fáil. Cowen and Ahern’s able and informed testimony at the Banking Inquiry showed that the Governments they led were neither reckless nor directionless. Yes, they made mistakes, but as they proved by their command of the facts and the details they did have a plan and were, in the teeth of a global financial crisis, making the best decisions they could on the basis of the facts and information before them. Their assured solo appearances contrasted with Enda’s assisted one, where he did the general patter and handed over to Richard Bruton when the questions become difficult. The big fallout from the Banking Inquiry is not damaging Fianna Fáil the way Fine Gael’s strategists planned it would. They were full sure that parading the old familiar Fianna Fáil faces before the committee to be questioned and pilloried would re-ignite the public anger and ire of the 2011 election. Why else delay the hearings until the final run up to the election. But they were wrong. While Fianna Fáil is hardly soaring in the polls, its support has been creeping up painfully slowly, just while the support levels for Fine Gael’s preferred enemy: Sinn Féin, have been slipping steadily downwards. Hence the need for Fine Gael and for Enda is up the ante on the faux narrative and hype up the legend of Enda of the West complete, to return to the western movie motif, with the good guy white hats they have fabricated for themselves. The problem is that life and politics today is much more questioning and techni-coloured now than it was in the days of the black and white western – no matter how exciting the story sounds. 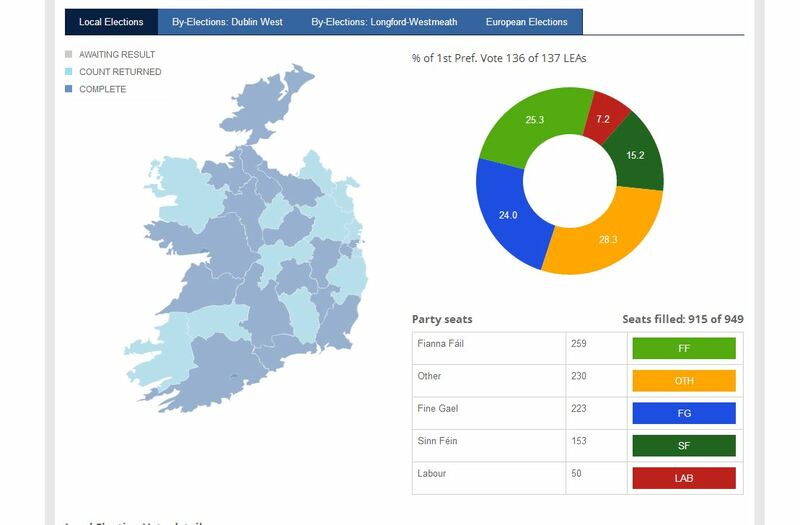 I have now updated my initial thoughts, musings, observations and mild rantings on the implications of the local election results, particularly Fianna Fáil’s stronger than expected showing. This was first posted on Sunday morning – updated on Monday morning to reflect the revised party national totals in the Local Elections. “If history repeats itself, and the unexpected always happens, how incapable must Man be of learning from experience.” – George Bernard Shaw. Yesterday we saw history repeating itself, with the electorate visiting upon Fine Gael and Labour almost exactly the same devastating blow it had served up to Fianna Fáil and Labour five years earlier. In 2009 Fianna Fáil lost around 39% of its support (when compared with 2007) while the Greens endured a massive reduction in its vote of 76%. Yesterday, based on the Local Election results to hand, Fine Gael lost 34% of its support and Labour lost 63%. While the story of the Local Elections is the rise in support for Sinn Féin and the Independents and the scale of the loss for Labour, the Fine Gael haemorrhaging of support should not be ignored. Indeed, the case can be made that the real story of the election is this massive Fine Gael loss – a loss that should not be glossed over by what might appear to be its reasonable performance in the European Elections. Losing 100 plus Councillors, on a day when you have increased the number of available council seats, is a political meltdown of Fianna Fáil in 2009 proportions. It will send a shiver around the Fine Gael backbenches that will match that currently coursing along the spines of their Labour colleagues. Leo Varadkar’s line that the next election will be a battle between Fine Gael and Sinn Féin was a clever attempt to calm the troops with the notion that their lost support will come back when the Irish voters realise that Fine Gael is all that stands between them and the Shinners. It’s clever line, but a flawed one. For it to offer any comfort it would need to be underpinned by Fine Gael still remaining the largest party – but it hasn’t. By the time the dust settles it will become clear that the other big story of the locals is the return to frontline politics of Fianna Fáil, even if its European results are a bit rocky. If the battle of the next election is, as Varadkar suggests, to be fought on the question of where you stand with regard to Sinn Féin then Fianna Fáil, with a few more weapons in its armoury, is standing on better – and now even firmer – ground than the depleted followers of Enda. While Fine Gael may see itself as the antithesis of Sinn Féin, Fianna Fáil can challenge SF’s voodoo economics every bit as credibly as FG, but with the added bonus that that can better undermine and dismantle the Shinner’s fallacious claim to Republicanism, especially in its back yard. The other story of the Fianna Fáil result is its incredible variety. Its national level of support at just over 25% belies some very good and incredibly bad local results, especially in urban centres. They range from the sublime such as its 49% in Bailieborough-Coothall 39% in Castlecomer and 38.4% in Ballymote-Tobercurry to the ridiculous: such as its 4.9% in Dublin North Inner City, 6.8% in Tallaght South and 8.7% in Lucan. While there are several other disappointing low teen results in urban centres across the country e.g 9.6% in Waterford City South, 10.5% in Bray and 13% in Limerick City North, it is no coincidence that the single digit performances are in Dublin. That is not to say that the Capital is a wasteland for Fianna Fail. Contrast the single performance mentioned above with the parties stunning 27.3% in Castleknock, its 24.2% in Clontarf and its 22.3% in Stillorgan. While the overall Dublin result of 16% points to a major problem for the party, the variety in results, highlighted above, shows Fianna Fáil’s further potential for growth and renewal in large swathes of Dublin. It is the very patchiness of its result that points up where the party needs to work harder and better. Far too many candidates in Dublin were left to struggle on by themselves with no structured national campaign to underpin their efforts. Having “Fianna Fáil” on your poster does not guarantee a good new candidate a certain base level of support in Dublin and other urban centres in the same way as having “Sinn Féin” on your poster did for their new first time candidates. Indeed it does not offer the prospect of that base level of support as it does in non-urban Ireland. The candidates in Dublin raised the Fianna Fáil vote to their level, not the other way around. The vote in Dublin and other urban centres, is not the party vote plus the candidate’s unique personal support – it is just the latter. In certain parts of the city is it the unique personal support minus the residual antagonism to Fianna Fáil. The “Fianna Fáil” identity is Dublin is not a coherent identity based on a core defining message from the party as a national political party: it is the collective identities of its various candidates. This is not to underestimate the particular nature of Dublin voters, especially their looser party allegiances; it is just to point out that Dublin voters are just as likely to be receptive to a national message, just less continuously loyal to it. It is not that there are not answers to these questions, but rather that the party has not sufficiently defined and substantiated them. It is work that can and must be done. That work is not aided or encouraged by intemperate outbursts or Quixotic threatened heaves. The issues are policy and organisation – not personality. The 24.3% of voters who abandoned Fine Gael and Labour saw their political alternatives this week. Some said independents, some said Sinn Féin – though not by a large margin as the swing to Sinn Féin since the 2011 election is in the 5.3%, but even more said Fianna Fáil with a swing of just over 8%, but the point should not be lost that the biggest single section of them said: none of the above. The ones who stayed at home are the ones who were badly let down by Fianna Fáil and are now just as angry with Fine Gael and Labour for promising them a new politics and then delivering the old failed politics as usual. Perhaps they concluded that they could afford to sit out these second order elections, as they do not see how the results will change their lives, they will not be as sanguine at the next election.